Municipal Council/Aldermen: Hopkins, Minnesota (Village Council, 4 terms); 19?? to 19?? Municipal Government: Hopkins, Minnesota (Village/City Clerk, 4 terms); 19?? to 19?? School Board/Administration: Hopkins, Minnesota (School Board of Education, Clerk, 10 years); 19?? to 19?? As President Pro Tem, Senator Archie Miller became lieutenant governor when Governor Harold Stassen resigned on April 27, 1943 elevating Lt. Governor Edward Thye to governor. Senator Miller was sworn in on May 6, 1943 and resigned from the Senate on May 10. The Senate met just once, in a four-day special session that began on March 8, 1944, during Lt. Governor Archie Miller's tenure. He served as the presiding officer and did not participate as a senator. He pursued running for lieutenant governor in the 1944 general election but the Minnesota Supreme Court determined in April 1944 that he was ineligible to run for that position. The primary reason was because the Legislature had raised the pay of the governor, the lieutenant governor, and legislators; members of both houses were barred from running for governor or lieutenant governor in the upcoming election. 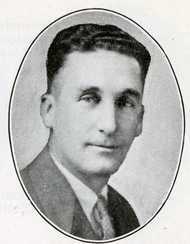 Instead, Archie Miller ran in a special election in November 1944 for the seat he had resigned from. He won and returned to the Senate in January 1945. He played the clarinet in the Hopkins Village Band. Leadership Notes: He died while in office on February 11, 1958. Session Notes: He died while in office on February 11, 1958. 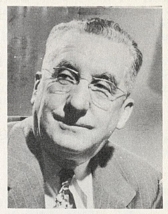 Leadership Notes: He became Majority Leader after Charles Noah Orr died in office on January 10, 1949. Session Notes: He was required to run in a special election to complete the final two years of his four-year Senate term after he served as lieutenant governor from 5/6/1943 to 1/2/1945 because he resigned from the Senate on 5/10/1943. Leadership Notes: He became Minnesota's Lieutenant Governor on May 6, 1943. Session Notes: As President Pro Tem, Senator Archie Miller became lieutenant governor when Governor Harold Stassen resigned on April 27, 1943 elevating Lt. Governor Edward Thye to governor. Senator Miller was sworn in on May 6, 1943 and resigned from the Senate on May 10. The Senate met just once, in a four-day special session that began on March 8, 1944, during Lt. Governor Archie Miller's tenure. He served as the presiding officer and did not participate as a senator. He pursued running for lieutenant governor in the 1944 general election but the Minnesota Supreme Court determined in April 1944 that he was ineligible to run for that position. The primary reason was because the Legislature had raised the pay of the governor, the lieutenant governor, and legislators; members of both houses were barred from running for governor or lieutenant governor in the upcoming election. 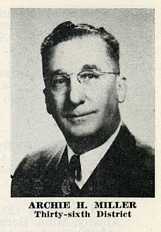 Instead, Archie Miller ran in a special election in November 1944 for the seat he had resigned from. He won and returned to the Senate in January 1945. Session Notes: George A. Turnham contested the election of Archie H. Miller in the 1930 election. 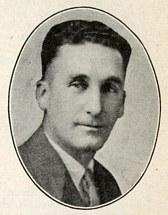 Archie H. Miller was determined to be the winner of the election and entitled to the seat. Duckstad, Robert J. Memorandum Re: Election Contests. Minnesota: Office of Senate Counsel, December 24, 1970, p. 1-4. In Memoriam: Senators Claude Baughman, O.H. Griggs, Charles A. Lund, Archie H. Miller, Hans C. Pedersen, Edward R. Ribenack, and R.C. Sletten. State of Minnesota Senate Chamber, April 3, 1959. - The information on Archie H. Miller also appeared in the Minnesota Journal of the Senate, April 3, 1959, p. 908-910. Turnham v. Miller, Contested Election. Minnesota Journal of the Senate, March 4 and 5, 1931, p. 390-391, 405. 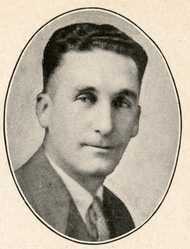 Archie H. Miller. Biographical Information from the Minnesota Historical Society's Governors of Minnesota.